Propelled by a genetic engineering technique that presents bacteria with a simple choice—adapt or die—research from the University of Nebraska–Lincoln just punched through that 40-year-old ceiling like Iron Man through papier-mâché. 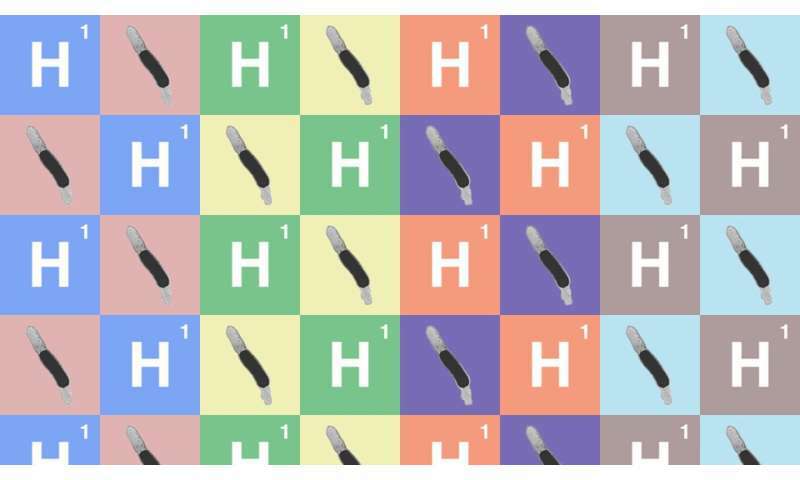 A version of the Thermotoga maritima bacterium engineered by Raghuveer Singh, Paul Blum and their colleagues produced 46 percent more hydrogen per cell than a naturally occurring form of the same species. The team's highest reported yield—5.7 units of hydrogen for every unit of glucose fed to the bacterium—easily surpassed the theoretical limit of 4 units. The feat represents a breakthrough in the global effort to scale up the sustainable production of clean-burning hydrogen for vehicles and heavy industry, Singh said. Most commercial hydrogen comes from refining non-renewable fossil fuels such as natural gas, oil and coal—processes that generate sizable amounts of carbon dioxide. So the researchers decided to temporarily inactivate a gene that has no effect on cell growth but slows hydrogen production in T. maritima. When they did, a second gene—this one involved in transporting sugar—spontaneously mutated to prevent a lethal buildup of sugar-based metabolites. That mutation also dramatically redirected the bacterium's energy expenditure from cell growth to hydrogen production, creating a new strain that the researchers named Tma 200. Singh, Blum and colleague Derrick White have since worked with NUtech Ventures to apply for patent protection of the genetic technique, which Singh described as a "promising strategy" for increasing bacterial production of any potential metabolite. The team recently detailed its work in the journal Applied and Environmental Microbiology. Since it is a marine organism, it will be more prudent to transfer that gene into some fresh water dwelling microbes also. One of it may take it and show similar result, Who Knows? A way forward for the study. Either that or they could just add salt to the growth medium. Yeah, I don't think things work like that. What they mean is, the bacteria kept dying early until one of them came up with the mutation and then the mutation spread in the population. 1 Liter of monatomic hydrogen every 9 seconds using 187 watts electrolyzing seawater, brine, or fresh water.